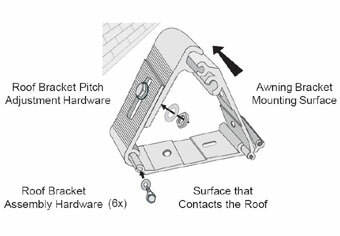 (A) Measure the height of the wall where you want to install your awning. You need at least 7 ft. 6 in. from the deck or patio floor up to any eave, gutter or roof overhang to install a SunSetter Motorized PRO, PRO XL, Motorized, Motorized XL or Vista Awning. 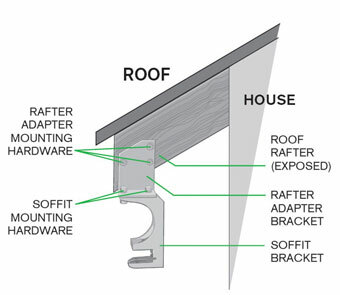 (B) Measure along the side of your house to decide how wide an awning you want. The SunSetter Motorized awnings come in pre-cut widths of 8 ft. and 10 ft. to 20 ft. in one-foot increments. The SunSetter VISTA awnings come in pre-cut widths of 8 ft. and 10 ft. to 18 ft. in one-foot increments. With the exception of the 10' awning, which measures 123" left to right, all other lateral-arm (Motorized or VISTA) awnings measure exactly like their defined size. Example, a 12 ft. awning is 12 feet wide. The actual fabric width is 4-1/2" less than the total awning width. Also be sure you have at least 8 inches of clear, unobstructed space horizontally along your wall where the awning will fit against the house. (C) For Motorized PRO, PRO XL, Motorized, and Motorized XL models, decide on which end of your awning you would like your electrical cord to come down from, the left or the right, as you are facing the house. The plug-in cord can be installed at our factory at either end.